Professor Ash is a highly regarded Consultant and Specialist Orthodontist with special interests in sleep related breathing disorders, TMJD and bruxism. Visiting Professor Ash is the inventor of the Somnowell Chrome, the world's first 4th generation mandibular advancement appliance. In-depth course covering background, options, evidence, management, delivering a service, problem solving, documentation, getting referrals and making it pay. Somnowell Practitioner Registration, Somnowell Practitioner Manual, all necessary forms and questionnaires, patient information leaflets, and posters. Access to the online Somnowell Practitioner portal with everything you need to provide and promote your new service. Including the latest clinical information, marketing tools, training, videos, forms, letters, and more. We send you our full range of posters and patient information leaflets for your practice. Full access to the Somnowell Practitioner portal for the latest clinical guidance. Become Somnowell certified with full access to Professor Simon Ash's introductory Somnowell course. The Somnowell is the first 4th generation mandibular advancement appliance, made from super alloy chrome cobalt. 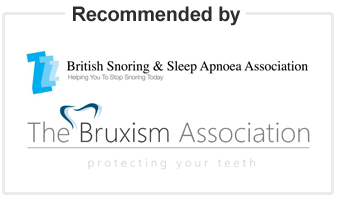 Recommended by the British Snoring & Sleep Apnoea Association and the Bruxism Association. SPECIAL OFFER - 10% discount for both Introductory Course and Advanced Course when purchased together. I have recently become involved with Somnowell. I receive referrals from them and to date I have made 12 Somnowell appliances with 100% success and lots of good feedback from the recipients. All of the cases have been people from around my area but not patients of my practice so this has been a good new source of revenue as well as helping people suffering the problems of snoring and apnoea. The Somnowell is a quality product and it works! Dr Colin Doody BDS: "a good new source of revenue"
I am delighted with a steady flow of referrals which is due to an extremely proactive marketing strategy and this is followed up to ensure patient satisfaction. It is indeed quite the best mandibular advancement appliance in it's field and can be highly recommended with a very high success rate. Dr Graham Catchpole BDS: "delighted with a steady flow of referrals"
I have been most impressed by Somnowell's excellent marketing and patient information. They have introduced numerous high quality patient leads who have been delighted by the comfort and efficiency of their appliances. Dr J B BDS: "numerous high quality patient leads"
I have been working in a major sleep studies unit, fitting a variety of mandibular advancement splints, for the last 17 years. The Somnowell appliance is by far the best appliance I have ever used. Some of my long-standing patients who have struggled with other custom-made splints have converted to the Somnowell and have been amazed at how easy it is to wear and how successful it is in curing their snoring and sleep apnoea. Dr Lindsay Winchester BDS LDS DOrth MSc MOrth FDS: "by far the best appliance"
Payment can be made by debit card or credit card using Paypal's secure payment system. As soon as payment is received your login details for the online course will be sent to you.